Filkins, Laurent, Bracken, Dukart and DeRaeve. They were the shining stars of the Lake Oswego football team's potent offensive unit. That group — junior running back Casey Filkins, senior quarterback Jackson Laurent, senior running back Collin Bracken, senior running back Keenan DeRaeve and junior wide receiver Thomas Dukart — accounted for 32 touchdown passes, added another 32 rushing scores as well as 20 TD catches in 2018. 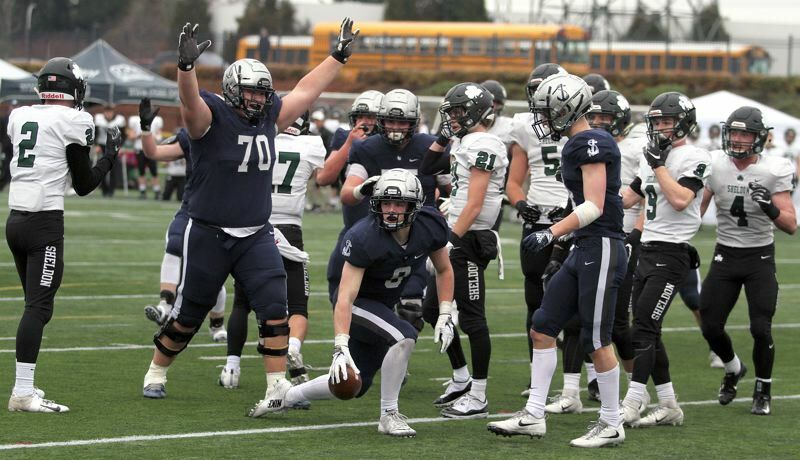 But that quintet, to a man, along with Laker head coach Steve Coury, said that this year's Class 6A state championship was keyed by a different group — Lake Oswego's talented offensive line. That group — senior left tackle Tanner Hall, senior left guard Ryan Bertelsen, senior center Mo Linver, junior right guard Cody Carlson, senior right guard Asher Corbett, junior right tackle Tiger Shanks, and junior Marshall McGuire and senior George O'Brien at tight end — proved yet again on Saturday that they are among the state's very, very best. "(Sheldon is a) great, physical team and we knew that coming into this game," said Filkins, who followed his line to 90 yards and four rushing touchdowns on 16 carries in Saturday's win. "Our line knew that they would have to play just as physical as their line to beat them and they did that. That's what got us the win." "They're the reason we're here," said Laurent, who wasn't sacked on Saturday, and picked up 21 yards the only time he did have to run in the title contest. "They're the ones who won the game. They are the ones who make everything happen." For their part, the Laker line ascribed their success to hard work and preparation. "Really, we just had to get mentally ready for it," said Bertelsen, a first-team all-Three Rivers League pick. "That's what we thought about the whole week — just getting ready to really run the ball on them." Over the course of the year, the Laker line helped the team average almost 38 points per game against one of the state's toughest schedules. Indeed, Lake Oswego's 14-game slate of opponents in 2018 included eight contests against top-nine opponents and another three against teams ranked between 11-16. Never was the LO line's ability more apparent than on the team's game-winning drive against Sheldon on Saturday. After the Lakers took over at their own 25-yard line with 5:47 left to play and facing a 27-26 deficit, Lake Oswego let Filkins and the LO offensive line take over the game. The Lakers — facing a Sheldon defense that had allowed just 17 points a game during the first 13 weeks of the '18 season — drove 75 yards on just seven plays for the game-winning score. They ran the ball on six of those plays, with Filkins going right up the middle on all six, picking up 47 yards along the way, including the play that turned out to be the game-winner — a 1-yard dive out of the Wildcat formation with just 2:33 left in the contest. "The guys have done that all year long. They never quit," said Lake Oswego head coach Steve Coury. "There was no doubt, but having them come through was really something to watch." Laurent was even more succinct in his praise. "Without them, there is no us. Without them, there's no me. Without them, I'm dead," Laurent said. "Without them, the running backs don't run. They kept me healthy and they kept me on my feet. We've had linemen dinners every single week, so hopefully, they're happy blocking for me." After holding their own — and more — against a Sheldon defensive line that had a 20-pound per man weight advantage, Bertelsen shared the final key to his line's success against the Irish. "What we were always told, freshman year up, was 'You're not always going to be the biggest guys on the field, but it's about your heart and what your mindset is,'" he said. "We've taken it to heart since our freshman year and beyond."